The World Economic Forum is warning of the long-term risks of environmental degradation, with four of the top five most impactful global risks in 2019 related to climate change. 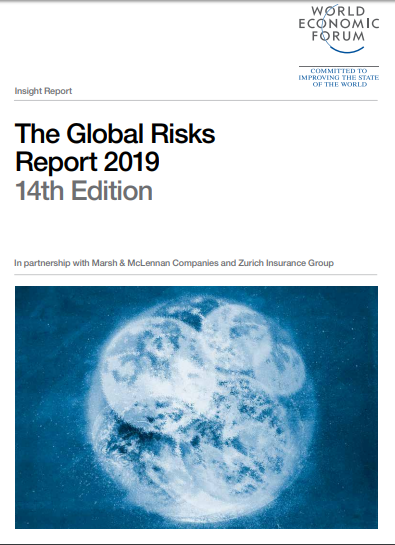 The report presents the results of WEF’s latest Global Risks Perception Survey, in which nearly 1,000 decision-makers from the public sector, private sector, academia and civil society assess the risks facing the world. The experts are warning that if they remain unresolved, the tensions will hinder the world’s ability to deal with a growing range of collective challenges, from the mounting evidence of environmental degradation to the increasing disruptions of the Fourth Industrial Revolution. Over a ten-year horizon, extreme weather and climate-change policy failures are seen as the gravest threats. Nine out of 10 respondents expect worsening economic and political confrontations between major powers this year. Rapidly evolving cyber and technological threats are the most significant potential blind spots; we still do not fully appreciate the vulnerability of networked societies, the report says. “Persistent underfunding of critical infrastructure worldwide is hampering economic progress, leaving businesses and communities more vulnerable both to cyberattacks and natural catastrophes, and failing to make the most of technological innovation.